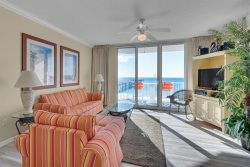 "Pure Bliss" is a beautifully upgraded Gulf front condominium on Navarre Beach. This condo offers upscale amenities such as a fully equipped kitchen with granite counter tops, tile floors in the kitchen, hallway and bathrooms, a stackable washer and dryer, flat screen TV's in the living room and master bedroom, a private balcony with amazing views of the Gulf of Mexico and high speed internet. Accommodations include a king bed in the master bedroom, resort style twin bunk beds in the hall and a queen sleeper sofa in the living room. The unit's cool and refreshing beach decor is sure to help make your vacation a pleasure. Relax in the living room and enjoy the marvelous views of the Gulf through the large floor to ceiling windows or enjoy them from the unit's private Gulf-front balcony. Accommodations include a king bed in the master, sleeper sofa in the living room, and two twin beds in the built-in bunk alcove. This was our family's third visit to Summerwind. We absolutely consider it our second home and have no plans to look any further when visiting the Gulf.